At the opening ceremony of the railroad section from Khasan station in Primorye Territory, Russia, to Rajin station in North Korea. South Korea is unlikely to immediately rejoin a trilateral logistics project with North Korea and Russia, which could have reduced the cost of two-way trade between Seoul and its European partners. Moscow’s losses generated by South Korea's refusal to buy a share in a major trilateral logistics project with North Korea and Russia are still unclear, experts familiar with the situation say. 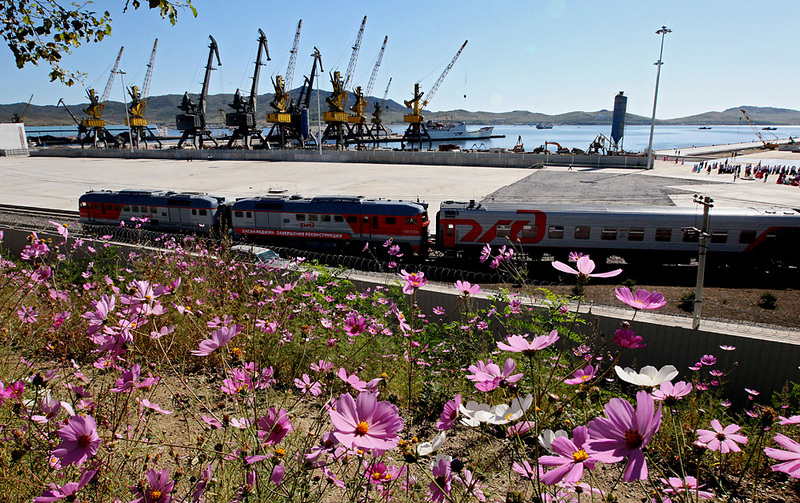 In December 2015 a consortium of three South Korean companies, Hyundai Merchant Marine, Korea Railroad and Posco, were promised a government loan of 100 billion won ($81 million) to buy 49 percent of Russia's 70-percent share of RasConTrans, which owns the Hasan-Rajin railway and a transshipment terminal at the North Korean port of Rajin. The remaining 30 percent stake in the company belongs to North Korea. According to Lyudmila Zakharova, a Korea expert from the RAS Institute of Far East Studies, South Korea's strong reaction to its northern neighbor's satellite launch and nuclear tests makes it clear that Seoul will not return to the project at least until 2018, that is, while Park Geun-hye is still president. Without South Korea's participation it will not be feasible to operate the railway at full capacity since it is supposed to carry five million tons of coal annually. However, Korea expert Georgy Toloraya believes that the project will not be abandoned. Russia will continue using it to supply Siberian coal to Pacific Region countries, primarily China, a country that accounts for 75 percent of Rajin's commodity turnover and which in 2015 received about 1.5 million tons of coal. Why does it matter for Russia? Zakharova says that the Rajin-Hasan Railway, in which Russian Railways invested about $300 million, is not only the largest Russian "commercial" project with North Korea's participation, but is also a political project. In the beginning of the 2000s Vladimir Putin, Kim Jong-il and the then South Korean President Kim Dae-jung agreed that Rajin-Hasan would be a pilot project for the Trans-Korean corridor that would connect South Korea to Europe via North Korea and Siberia. Toloraya said that if the Trans-Korean corridor was implemented it would not only bring economic benefits for all parties, but also stabilize the situation in the Korean peninsula and help to open and reform North Korea's economy. "This project is also important for Russia from the viewpoint of Moscow's strategy to include the two Korean governments in joint projects with Russia,” Toloraya added. The constant friction between North and South Korea has led to Seoul refusing to get seriously involved in the project. Russia still wants South Korean companies to become shareholders of RasConTrans. But North Korea’s recent satellite launch has proven to be a major obstacle for the project. Lyudmila Zakharova added that the South Korean press had estimated that coal supplies via Rajin-Hasan would have helped local consumers save up to 15 percent in transportation costs.